Everyone makes mistakes but the ODMafia. Everyone (except the ODMafia) may forget to write a date down or accidently not carry that two as they calculate the day of the Rapture, so, why not make money as you do? We know that we will be the Chosen One’s who make it, but a few of you may also have to stay behind as you were not as holy as we are. 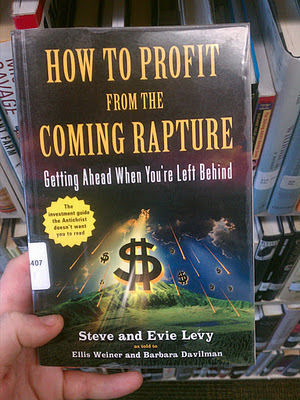 This book can be your survivor’s guide after the Rapture or bad date setting. 1. How to motivate people to give. 2. How to find the cheapest billboards in town to keep face while pocketing the rest of the money. 3. Get others to finance TV and radio spots while still giving money to fund your new Mercedes! Taking from the knowledge of Tim and Evie Levy who interviews hundreds of past Rapture giants will show you how you too can live high on the fear of others. Buy it now from us!